If you’re looking for the quick answer, I’ll save you time: The best marketing strategy is the one that gets your business the highest return on investment. Adwords and Search Engine Optimisation (SEO) or Search Engine Marketing (SEM) have a place in the marketing plan for every business. But which one is cheaper, faster, and easier? 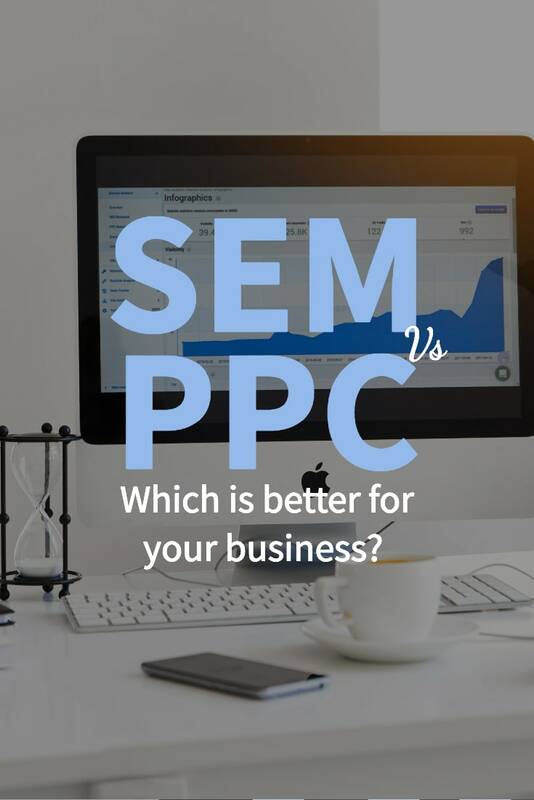 The SEM (Search Engine Marketing) vs PPC (Pay Per Click) debate changes with every new Google update. SEO/SEM evolves and internet advertising costs rise and fall. The best marketing solution depends on your needs. Let’s take a look at how you can figure out which works best for your business. SEO stands for Search Engine Optimisation. It’s sometimes called SEM. But we can call SEM the parent category and SEO the subcategory. SEO is a marketing strategy that involves designing a website to make it rank higher in Google’s search results. An example of SEM/SEO is keyword research. Keywords are phrases that people type into a search engine. Optimizing a website for high-volume keywords is just one part of SEO. Let's say you own a web design services company. You might target keywords such as “web design”, and “best website design” to sell your web design services. Adwords is Google’s advertising platform. It runs as an auction system whereby advertisers can bid on keywords and run ads to target people that search for these keywords. Adwords is a form of Pay-Per-Click advertising (PPC). Organic visits to websites are losing out to Ad clicks on Google. This is especially true for mobile and for local SEO results. 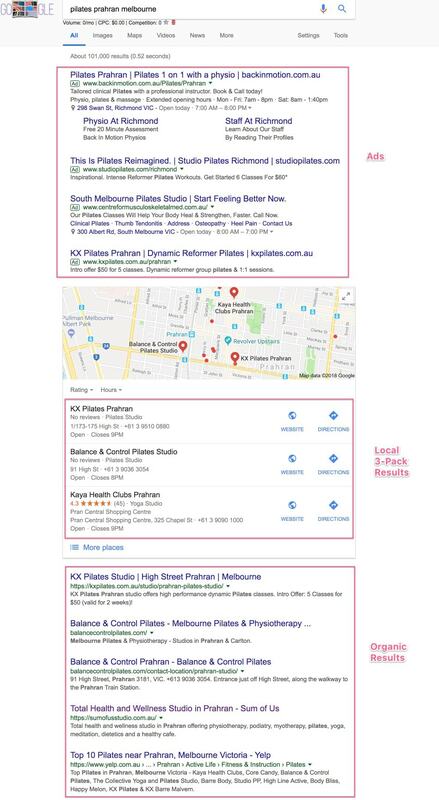 If you take a look at the SERP for a local SEO keyword, you’ll see 4 ads, map results, followed by the 3-pack, and finally the organic listings. To get to the organic results people need to scroll past the first screen. Personally, I very rarely click the ads. But I’m in the minority these days. Most people can’t tell the difference between an ad listing and an organic listing in the search engine results page (SERP). According to Wordstream, the number one spot on Google’s organic results has devalued by over 30% in two years. However, the study was limited in scope. And results based on searches with low advertising competition are quite different. But it does highlight a trend in how people find answers on Google. More and more people click on ads for answers. And, we can assume that over half of these people have no idea they are clicking on ads. Ignoring the sad fact that the search engine is turning into a marketplace rather than a place to find the best answers, ads are here to stay on Google. If you want to get noticed and have people click through to your website, you might need to pay to play. Say you have a product that nobody has ever heard of in a space that’s completely new. Now think about how people might search for that on Google. You can probably see the problem already. Nobody is searching for your product so targeting keywords is a waste of money. Adwords is great for targeting buyer intent keywords like “buy kombucha online”, “yoga studio Auckland prices”, and “where to buy bitcoin”. But if nobody is looking for your product or service on Google, it’s probably not worth running ads. However, if you have a new product in an established genre you can definitely target these people. Let’s say your service is a new type of exercise regime that is big in the US but nobody has heard of it yet in the UK. Your target market is the UK so what can you do? You find out from Keyword Planner or any keyword tool that the search volume for this new craze is a big fat zero. Adwords can still be very effective if you target keywords in the specific niche. It’s an exercise craze so keywords like “exercise classes near me”, “aerobic dance classes near me”, “best exercise for weight loss”, and “best way to get back in shape”. Some niches are saturated with content and authority websites. The marketing niche is notoriously difficult for SEO and SEM, for obvious reasons. The fishing, health & fitness, and dentistry niches, for example, are much easier. The people and companies building businesses in these niches are usually not marketing experts. Unless you have very deep pockets or years to spend creating content and optimising websites, difficult keywords like “New York travel” are best avoided. But you can still bid on that keyword in Adwords. It might give you a higher ROI. In some industries, PPC is very expensive. Content marketing has a better ROI. Requires skilled management and copywriting skills to be effective. SEO is great for branding and increasing your website’s authority online. The ROI on SEO is higher in the long term than PPC if performed correctly. Results take a long time to manifest. Adwords is a fantastic way to advertise, but it isn’t suitable for every industry, product, and service. In particular, unknown services, courses, products, and new concepts are sometimes better served with Facebook Ads. The advantage Facebook Ads have is that you can literally force them in front of people. The disadvantage is that people are usually not on Facebook to buy things. By placing ads in their feed or sidebar, you interrupt their browsing rather than answer a question. The alternatives to Adwords, in the advertising space, include Bing Ads, Facebook Ads, Pinterest Ads, Quora Ads, Reddit Ads. Which to Choose, SEO or Adwords? You can either do the research yourself using keyword tools or you can hire a marketing expert. Marketers will help you figure out the best strategy. Anyone that recommends blanket coverage of all channels (content marketing, PPC, Social, etc) is not to be trusted. Testing channels is a great idea but focusing on what works is a much better idea. Which of SEO or Adwords works better for you can be determined by proper planning, testing, and analysis. The ideal way to go is to use both SEO and Adwords PPC together. Use data collected from Adwords to power your SEO campaigns. Use SEO to drive organic traffic to your website and use Adwords to re-target these visitors with ads. Split your marketing into low-cost PPC keywords and high-cost SEO keywords. Interested in Content Marketing or Google Adwords Management for your business? 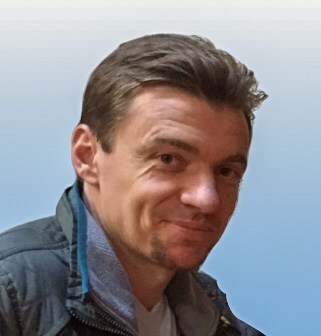 Pingback: Do You Need An SEO Specialist?